And since I have to drive her, I often end up volunteering with her. In searching for options, I first thought of volunteering at Red Rock Canyon. I had already volunteered with the Graffiti Removal team, and at the time I remember thinking it would be a good activity for kids and teens. Knowing that someone has to remove it would be a good deterrent to defacing Red Rock. That didn’t work out with our schedule, but luckily there was a Canyon Cleanup scheduled for an upcoming Teacher Workday. I contacted the coordinator, Liz Carmer, to see if we could join. 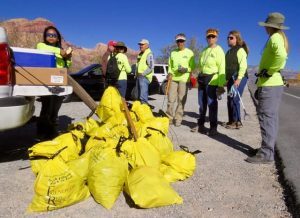 I discovered that the Canyon Cleanups are very popular and space is limited, so you have to register early. Fortunately, there were still a few spots left. I signed up for three spots – my daughter, her friend and me. When we arrived at the Visitor Center the day of the cleanup we were given bright yellow vests, bottles of water and best of all, the long metal trash. rocks in the parking lot. After driving out to Calico Basin and parking along the main drive with the others, we ventured out into the desert. It wasn’t long before the girls raced off, spying a plastic bag on a bush in the distance. I followed more slowly, watching as they darted from one piece of trash to another. trash! !” as they pretended to duel over the prized item. But I could understand the excitement. Searching the landscape for a glimmer of metal, cardboard or plastic reminded me of the thrill of searching for plastic colored eggs in an Easter egg hunt. volunteers about how important it is to get young people involved. One volunteer said people always complain that Las Vegans are shallow, but you just have to take the initiative and look for the other people who are interested in making a difference. “They’re out there,” she said. Welcome new contributor to the Rock magazine – Dana S. Raborn. 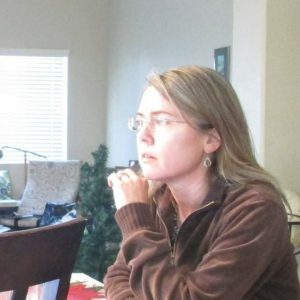 Dana is a scientific editor with a background in urban planning. She and her family relocated to Las Vegas three years ago and live minutes from Red Rock Canyon. She enjoys volunteering at Red Rock as well as hiking, painting, music, sailing and kayaking.